The Cowan Report: Simon Hughes Joins Attack On H&F Conservatives' Tax-Payer Funded £7,000 Booze-Up But Shouldn't He Prioritise Sorting His Government's Trillion Pound Economic Nose-Dive? Simon Hughes Joins Attack On H&F Conservatives' Tax-Payer Funded £7,000 Booze-Up But Shouldn't He Prioritise Sorting His Government's Trillion Pound Economic Nose-Dive? 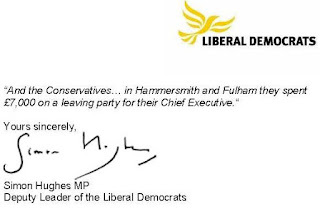 A local resident sent me this extract from Simon Hughes' latest missive. It was sent out on the 30th April and, rather typically, he attacks all the main UK political parties. He lays into his Conservative Party allies with particular venom and tells how they have squandered public money. One example he cites is our very own Hammersmith and Fulham Council where H&F Conservatives famously wasted £7,184.00 of tax payers' money on a Monday afternoon booze-up. Regular readers will recall that in the heat of all the public outrage, this caused local Conservatives to fall back onto the ill-advised argument that their afternoon shindig was good for staff morale. They said this despite record redundancies and pay freezes for front line staff and during a period when senior officials reaped the benefits of some of the largest inflation-busting salary rises in the UK. 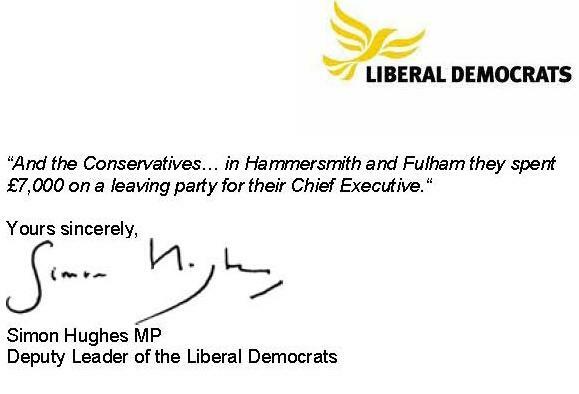 While I suppose it is good to have the famously slippery Mr. Hughes leap onto this bandwagon, I think most people would be happier if the Deputy Leader of the Liberal Democrat Party focused on the big issue facing our country. He needs to put his energies into getting his government to drop its woefully inept austerity gamble with the UK economy. As Nobel Prize winning economist Paul Krugman points out: "Now Britain is officially in double-dip recession, and has achieved the remarkable feat of doing worse this time around than it did in the 1930s... They will not change course, which means that Britain will continue on a death spiral of self-defeating austerity."